How will AI affect travel jobs? With reports about air stewards being replaced by bots, and the ever-increasing rise of Artificial Intelligence (AI), it’s tempting to reach for the panic button. But my advice is stop and wait. Like most things, how AI affects travel jobs will depend on how AI technology is used. Think creatively, and AI could create more travel jobs. Some travel bots already do a good job. For example, I love the self-check-in at CitizenM hotels. It saves me time, and a human is always there if I need help. Because that’s the key, we need humans as well. Without that I would become frustrated if something went wrong, which, as this robot fail video shows, is always a possibility. The technology still has a way to go in many areas. If a bot hands me a hot towel on a plane, as predicted in this BBC business report, I don’t think I’ll mind. But what if I ask for help getting my bag down and need to describe that bag, or have to explain a medical problem? At that point I want a real steward who understands the nuance of language without me having to resort to robot-speak. Having said that, some airlines already offer awful human service. Perhaps they could improve with the investment of AI? Companies must be clever and use AI to enhance not diminish their service. Could AI cause travel disasters? This Guardian article says a cargo plane could soon be unmanned. I predict that how AI affects travel jobs in this sector will be to reduce the number of pilots to one per flight, followed by an unmanned plane. However, like with autonomous cars, if there is an incident it will set things back considerably. Safety must be the first consideration. But remember, disasters happen with people, as well as with technology. Can travel bots replace human service? I don’t believe good human service can be replaced by bots, but AI can enhance good service. We can get basic information and booking done via bots then use humans to provide detailed service. 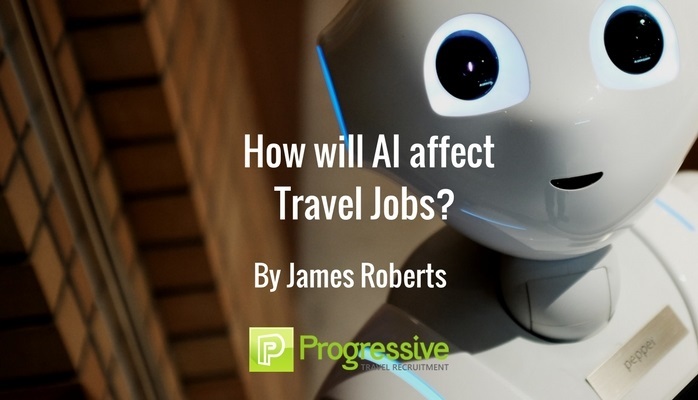 With the rise of experiential and transformational travel, more humans are needed alongside AI in travel jobs to give the exceptional service that modern travellers expect. I said in a blog last year that I had returned to travel agents as e-booking and online hotel searches are frustrating and time-consuming. I’d rather get expert travel advice from a human than a bot. I am not a fan of chat bots in any industry; I prefer to chat face-to-face or over the phone with the option of being able to manage easier things on an app or website (like my Emirates or BA frequent flyer account). We are all different and travel companies need to be tactical in how AI affects travel jobs and traveller experiences. A BBC Travel Show review of the World’s Largest Cruise Ship, Symphony of the Seas, making her maiden voyage this month, showed one bar being controlled by cocktail-making robots. But this didn’t mean robots would control all the bars, it was simply a novelty. And someone would have to be nearby to check only over-18s were ordering robo-drinks, plus someone else who could fix those robots when they inevitably malfunctioned. As Progressive Travel Recruitment is about hiring talent for the travel industry, I would be silly to say I don’t have concerns. That said, many jobs lost to AI will be replaced by those needed to program and maintain bots. It is likely that we will see an increase in demand from our travel clients for programmers and product development. I would recommend those looking to start a career in the travel industry give this serious consideration.